It was my friend Carmi Levy who introduced me to the phrase tikkun olam, but oh, what a huge impact those two words have had on my life. It’s weird the way things resonate. You read a blog post about a concept, and that sits in your brain and stews for a while. It marinates, really, soaking up some of your flavor, sharing some of its own. Then you make a connection with someone else entirely, and the first thing suddenly bubbles up from the back of your brain, and you present it to the new person, and suddenly, connections are formed, substantive questions are answered, information and appreciation are shared. Six or seven years ago, Carmi talked about tikkun olam in his blog, and later that year, or maybe the year after, he did a last minute interview with me for All Things Girl when we had a planned “Man of the Moment” back out. 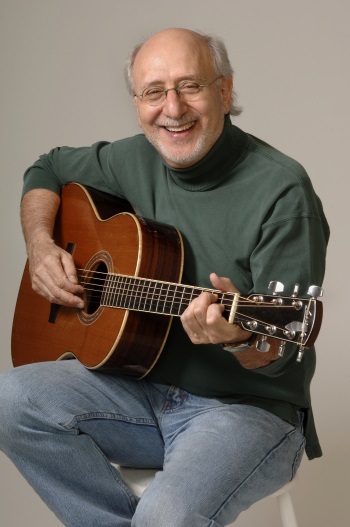 Five years ago, I was approached by a publicist working with Peter Yarrow, about the children’s books he was publishing, many based on some of his songs (I have signed copies of two of them), and that led to my second time seeing him live (the first was in 2002, for my 32nd birthday), in a special concert/talk at the local Jewish Community Center (in Dallas), and that led to an in-depth interview with him, again for All Things Girl. Having grown up on his music, and later shared chocolate-covered strawberries with him at a benefit concert, it’s possible his words have more impact on me than they would on someone who grew up ignorant of folk music, and of who Peter, Paul, & Mary were, but an impact they did have…echoing down the years. Last February, I was at Dallas Comic-Con’s annual Sci-Fi Expo, the most intimate of the three conventions they hold each year. It turned out to be the most intellectual con I’d ever attended, with Jaime Murray talking about feminism, strong female characters, and women in media, Saul Rubinek digressing from Warehouse 13 questions to talk about good works, Peter Weller giving us a lecture on Renaissance art, and Richard Dreyfuss speaking about education and activism. I asked him what tikkun olam meant to him. He lit up and we chatted for about ten minutes – not a long time, in the grand scheme of things, but longer than is typical when you’re supposed to be an autograph machine. I owe that encounter to Carmi. So why bring this up tonight? Partly, it’s because Carmi asked question on his blog today: What’s the most important little thing that’s happened to you – lately or ever? I answered it in his comments box, but it was a bit disjointed, and I wanted to expand, and partly because it’s the start of Hanukkah, and even though it’s not a holiday I celebrate (we did when my mother and step-father were first married, largely to acknowledge that part of my step-brother’s heritage), it’s one I observe. So, over the next few days, I’ll listen to the Hanukkah channel on the Sirius XM Radio (76 in the car), and I’ll fry some latkes, and I might think about lighting some extra candles. And I’ll spare a few moments to send up a prayer in remembrance of Bubbie, who grated potatoes by hand to make latkes for us one year, and who loved to hear me sing, and who would light up like a little kid getting the best present ever whenever she sat at a piano and played. And I’ll think about this concept of healing the world, and consider what I can do better, or more, or differently to meet my obligation, because no matter what religion we practice, what culture we come from we all have a moral imperative to leave the earth a better place than we found it, and as one year is dying and a new one is waiting to dawn, that seems a better use of brainpower than concocting frivolous resolutions.